A whole month documented, more or less. This week? It was all about just getting it done. We’ve had a couple of crazy weeks, full of sick kids and meetings and drama and it’s just been exhausting. This week, I didn’t care about coordinating or themes or anything other than just getting it done. and on this one, I used a little digital paper file. Not quite sure I like that exact color – I should pick up one of the Project Life digital sets to pull things together a bit more. This is what I love most about Project Life – my haircut, a Tweet of a Caleb quote and a reminder about an asthma attack. It’s minutia, really, but it’s the sort of stuff I find so interesting. 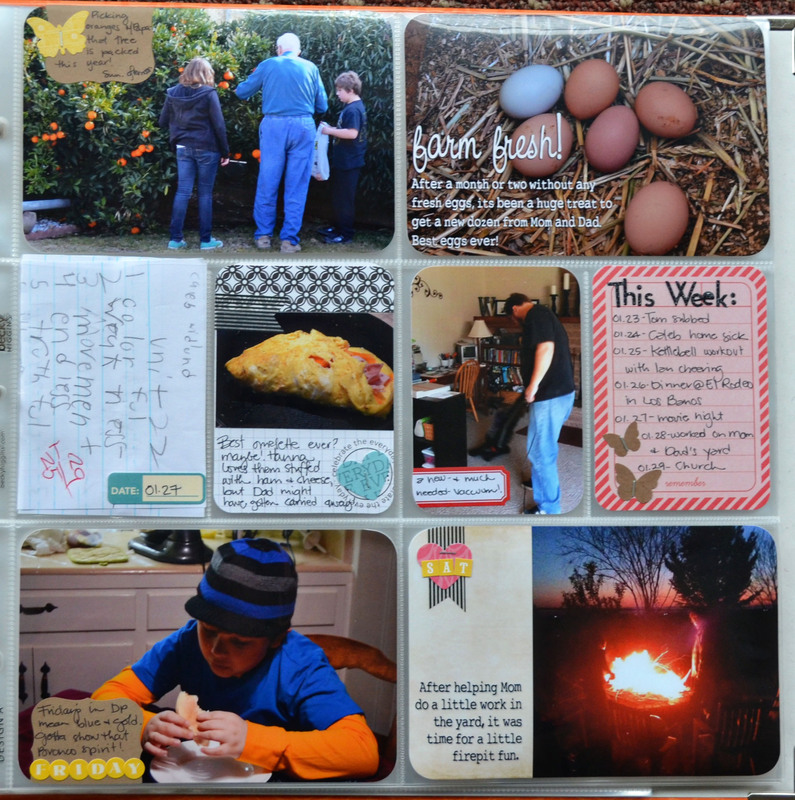 I love this second page – the reminders that we live in an agricultural area with the kids picking oranges with their Great-Grandpa and chicken eggs from my parent’s house…a spelling test…a really, really big omelette…the firepit at Grandma and Grandpa’s. 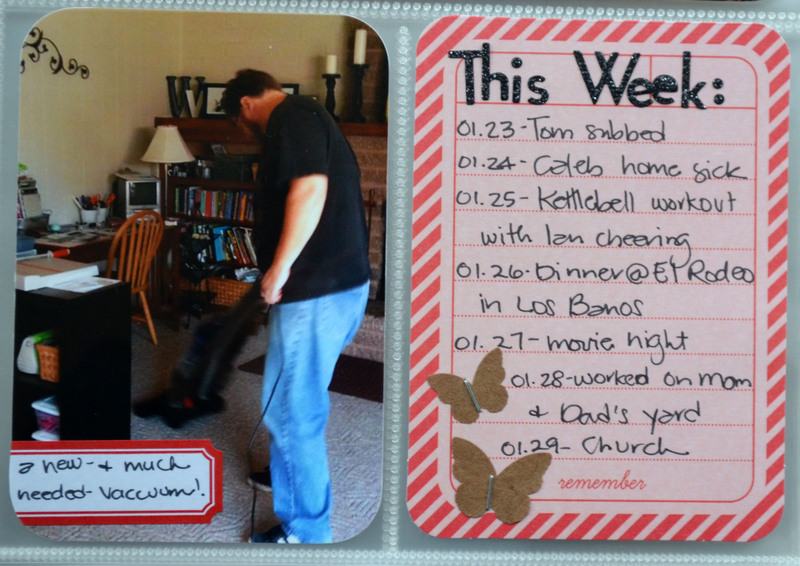 Still able to get that Week In Review card in – I love that I can jot down a bit more that I want to remember. Also, had to capture our new vaccuum. I don’t think you ever truly realize how bad the old one is until your first run of the new one. I’m finally working in some quotes, Tweets and Facebook status updates. Also, I’m making a point to work in more memorabilia. Love that Caleb’s spelling test just happened to fit in perfectly. For next week’s, I’ve got my notes from Wednesday night Bible study and one of those cup holders from Whole Foods. This week, I’m starting to work on picking a month’s worth of photos for a single layout to catch up these past few years that I haven’t scrapped. 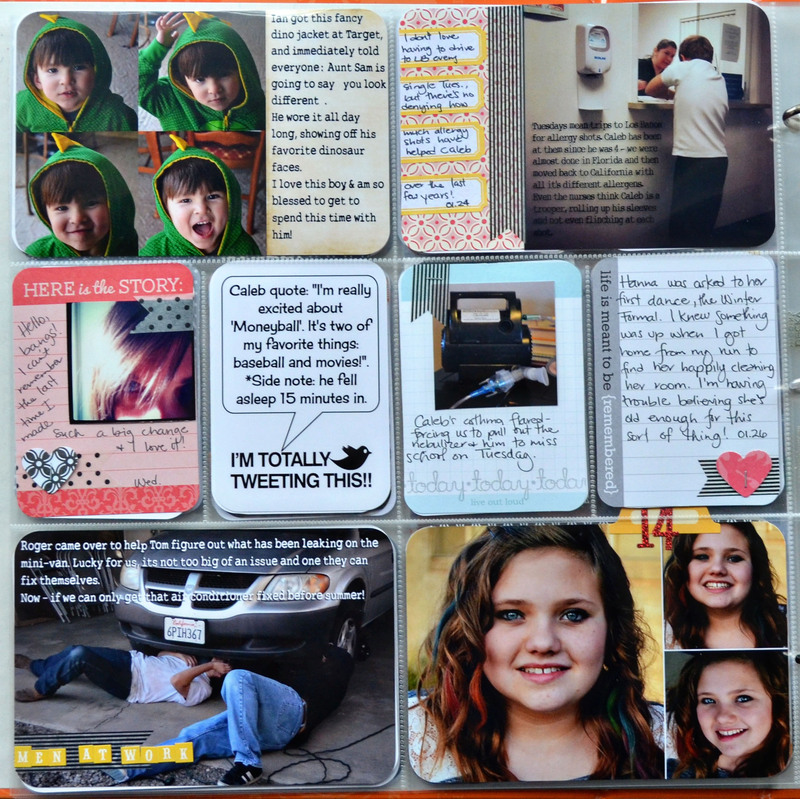 Not sure if I’m going to use Project Life protectors or maybe a combination of the Doodlebug ones. I’m thinking easiest would be the 6 4×6 layout. 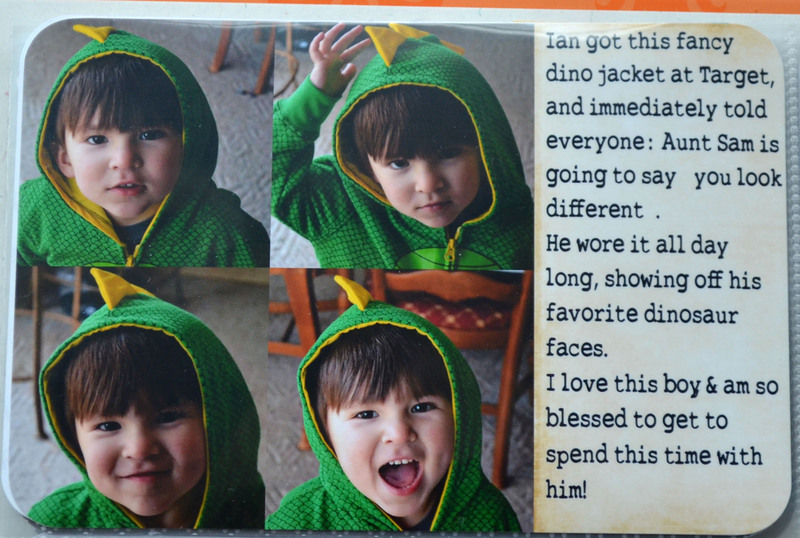 I told my Mom recently that I don’t see myself going back to “regular” scrapbooking. This feels so much more natural and organic, and maybe even authentic. All of my Project Life posts can be viewed here.